The Barclay’s Center in Brooklyn, New York, hosted three major super welterweight bouts on Saturday, in a card which was aired live by the Showtime pay cable network. First up was a twelve rounder between 30-3 former titlist Austin Trout and 20-0 IBF Super Welterweight Champion Jarrett Hurd. Neither man was dominant in the first, but Trout and his clean punching had an edge. Trout moved well, employed angles and hit with effectiveness in the second. The third was close, but a more aggressive Hurd may have taken it by a hair. By the fourth round, Trout was hitting hard and with precision. Hurd landed hard in fifth, however. Trout punched clean and often again in the 6th, yet by the end of the round, Hurd caused his man to stumble. Hurd continued to do damage in the early part of the 7th, but Trout was able to make up some ground. Next up was Jermell Charlo, 29-0 and Erickson Lubin, 18-0, for the WBC world super welterweight title. The first part of the first was slow. The second part was slow, too – until Charlo, the champion, took his man out with a single shot. “They threw a chair at my brother.”Charlo said after the bout, referring to an unseen incident. No one seemed to be seriously hurt. Not even Lubin. It was time for the final event of the evening. Cuban-American Erislandy Lara, 24-2-2, defended his WBA super world super welterweight title against former US Olympian Terrell Gausha, 20-0. Lara, the southpaw, was able to control the first. The second was more of the same. Ditto for the third. The crowd started booing at the inaction in the fourth – only to have Lara suddenly drop his man with a right. Guasha got up, but was unable to effectively engage. Laura continued to dominate in patient fashion. The fifth, sixth, and seventh were virtual repeats of each other. Lara dominated. Gausha was unable to make headway. The crowd booed again and began to empty the Barclay’s Center. In the eighth, Lara began to hurt his man. Gausha, though, was able to make it to the final bell. “There’s no change of gears,” Showtime’s Paulie Malignaggi claimed correctly. The fight stayed at the same pace throughout. Lara was rewarded with a unanimous decision win. One half of the powerful twin tag team duo was on display this past weekend as Jermell Charlo29-0 (14 KO’s) successfully defended his WBC junior middleweight title, stopping Charles Hatley26-2-1 via 6th round knockout. In his first defense of his WBC title against the no.1 contender, Charloshowcased a wide range of skills.Displaying offensive versatility;stiff jabs, accurate straight punches, counter left hooks, punching power and range-awareness. Charlo rocked Hatleyin the 2nd round, dropped Hatley with a right hand in the 3rd round and ultimately finished him in the 6th round. A boxing-brother tandem issomething we’ve witnessed in the sport as there are many successful examples throughout history. Juan Manuel and Rafael Marquez, Koki, Daiki and Tomoki Kameda, Ricky and Matthew Hatton, Michael and Leon Spinks, Roger, Jeff and Floyd Mayweather Sr., Vitali and WladimirKlitschko who reigned as heavyweight kings for more than a decade. 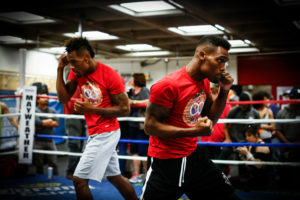 The Charlo brothers appear to be the next tandem to take over and they are twins – the Charlo brothers are only the second set of twins to hold world titles at the same time. The first is Khaosai Galaxy (junior bantamweight) and Khaokor Galaxy (bantamweight), of Thailand, briefly holding world titles simultaneously in the late 1980s. Jermell aims to dominate the junior middleweight division now that his twin Jermall moved up to the middleweight division. The younger twin brother (one minute younger) spoke of his ambitions post-fight after defeating Hatley. “They got a guy named JarretHurd that took my brother’s title – we could unify,” said Jermell Charlo. Hurd 20-0 (14 KO’s) recently won the IBF junior middleweight title Jermall Charlo 25-0 (19 KO’s) vacated in February. The possibility of facing and potentially defeating another undefeated champion, while adding an additional world title is a great accomplishment and feather on the cap. The other champions in the division are stable mate Erislandy Lara (WBA) 22-2-2 (14 KO’s) and Saul ‘Canelo’ Alvarez (WBO) 48-1-1 (34 KO’s). Lara and the Charlo brothers shared the same trainer, Ronnie Shields. Although Jermell is no longer with Shields, the prospect of Jermell and Lara fighting is less than likely. It’s also unlikely we’ll see Jermell vs. Alvarez, with Alvarez facing Julio Cesar Chavez Jr. at 164 lbs. and the Mexican star probably staying in the middleweight division after his clash with Chavez Cinco de Mayo weekend. Canelo’s ascension towards middleweight does open the door for Jermall however. Another notable name in the division is the former WBO junior middleweight champion Demetrius Andrade 24-0 (16 KO’s). He currently holds a portion of the WBA title – one of the many fragments and is adamant on beating both Charlo brothers. A fight between the two needs to happen. 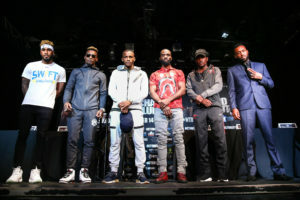 The winner has the opportunity to unify titles in the division and may establish himself as not only the best at 154, but as one of the top pound-for-pound fighters in boxing. Regarding Jermall at 160 lbs., he is ranked no.2 according to the WBC middleweight rankings and intends on becoming the mandatory challenger for Gennady Golovkin’s 37-0 (33 KO’s) WBC title. However he must defeat Argentinian Jorge Sebastian Heiland to secure that position. Jermall had a solid run at 154, defeating a faded world titlist at the time Cornelius Bundrage, a strong former champion Austin Trout and one of the best, undefeated, world contenders Julian Williams. The older twin brother was a terror at junior middleweight; technically sound, a nice blend of overall speed, punching power and athleticism. If Jermall can carry these traits to middleweight, he’ll present problems to anyone. Match-ups against Alvarez, Chavez, Golovkin sound intriguing on paper. Even match-ups against some of the other factors at middleweight; WBO middleweight champion Billy Joe Saunders, former titlists Danny Jacobs, David Lemieux and Andy Lee, all sound like interesting fights. It’s just a matter of manifesting. Can each brother put a strangle hold on their respective division? Will this be the year the twin tag team takes over boxing?